In many homes, the bathroom is the smallest room in the house and it may be difficult to fit a long traditional tub in the bathroom. In smaller bathrooms it may be better for the homeowner to install a small bathtub in the room instead of trying to cram a larger tub into the area and losing moving space in the bathroom. Small bathtubs make small bathrooms feel more open and comfortable and can ensure that you have plenty of room to move around in the bathroom. There are many different ways that a person can incorporate a small bathtub into their small bathroom in a decorative and sophisticated way. Small bathtubs are not always the rectangular, white ceramic creations that are found in so many homes. Many manufacturers have created small bathtubs in a variety of different shapes and colors to appeal to the people that have limited room in their bathrooms. One of the stylish new small bathtub models is the circular bathtub, a smaller bathtub with no sharp corners that can be placed in a much smaller area without sacrificing the space within the tub itself. These circular bathtubs are often highly decorative, with the rims of the tubs resembling stone blocks or made of beautiful decorative tiles. Many individuals choose to use these styles of bathtubs in high priced apartments and condos where space is limited and luxury is paramount. Some of the most popular small bathtub styles are the bathtubs that are deep enough to soak in. Although the length of the bathtub is shorter than some of its bigger brothers, the bathtub makes up for this by being extra deep, allowing the person to be sitting in the tub and still be submerged in the water to their shoulders or neck. These bathtubs often have a small ramp or step to help an individual get in or out of the bathtub and may have a ledge within the bathtub for the person to sit on. Small bathtubs can generally be placed in areas where a typical bathtub could not go, still leaving room to maneuver in the bathroom. Some models are designed to be placed across the corner of the room, halving the amount of space needed for the installation of the bathtub. 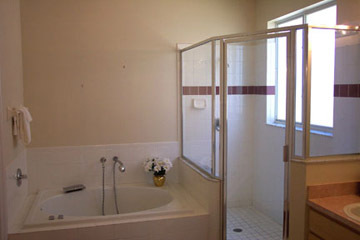 Other individuals choose to place the small bathtub in an area previously occupied by a small shower stall. There are many options for using a small bathtub in the home and the variety of choices available make it easy for the homeowner to find the small bathtub that is right for them.